The composite in Figure 6 clearly does not work; the foreground element does not contain the scene’s dominant color and is white-lit. That’s fine; it will better demonstrate the effectiveness of the following technique. Figure 6. 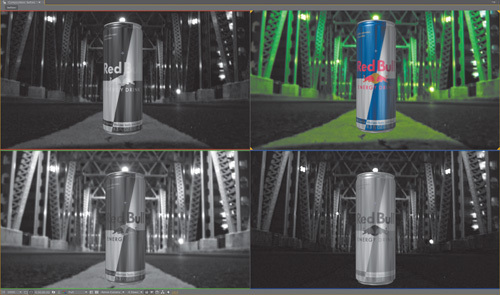 Not only is it clear that the can does not belong in the color environment of the background, the mismatch is equally apparent on each color channel. It helps that both the foreground and the background elements have some areas that you can logically assume to be flat gray. The bridge has concrete footings for the steel girders along the edges of the road, while the can has areas of bare exposed aluminum. This section discusses colors expressed as percentages; to see the same values in your Levels effect, use the wing menu of the Info palette to choose Percent for the Color Display. Apply Levels to the foreground layer. Switch the view in the Composition panel to Green (Alt+2/Opt+2). Not only is this the dominant color in this particular scene, but it is dominant in human vision, so green-matching is the first step in most scenes, not just this one. Begin as if you are looking at a black-and-white photograph, and match the element to this dark contrasty scene using Levels in the RGB channel. If the element needs more contrast in the shadows and highlights, as this one does, raise Input Black and lower Input White; if it needs less, adjust the Output controls instead. Finally, adjust the gamma; in this scene, should it come down to match the darkness of the scene or up so the element stands out more? The result should look like a monochrome photo whose elements match believably (Figure 7, part A). Figure 7. It’s fun and satisfying to pull off an extreme match like this channel by channel. The Levels settings come from looking for equivalent black/white/midpoints in the image and just analyzing whether the result looks like a convincing black-and-white image on each channel. 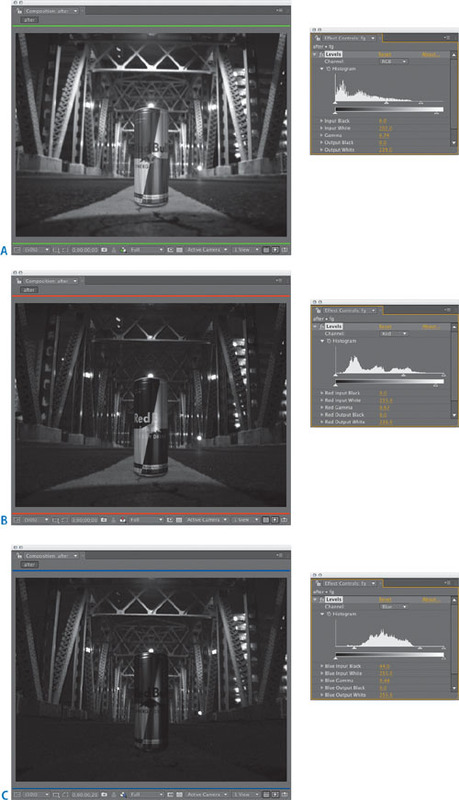 Switch the view (Alt+1/Opt+1) and the Levels control to the Red channel and repeat the grayscale matching process. Clearly, the foreground element is far too bright for the scene. Specifically, the darkest silver areas of the can are much brighter than the brightest areas of the concrete in the background. Therefore, adjust the gamma down (to the right) until it feels more like they inhabit the same world. Now have a look at the highlights and shadows; the highlights look a little hot, so lower Red Output White (Figure 7, part B). Now move over to Blue in the view (Alt+3/Opt+3) and in Levels. In this case, there is almost no match whatsoever. 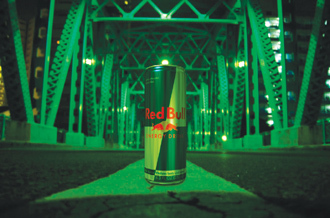 The can is much brighter and more washed out than the background. Raise Input Blue and bring gamma way down. Now the can looks believably like it belongs there (Figure 7, part C). It’s strange to make all of these changes without ever looking at the result in full color. So now, go ahead and do so. Astoundingly, that can is now within range of looking like it belongs in that scene; the remaining adjustments are subjective. If you want the can to pick up a little less green from the surroundings as I did, lower Green Input White. Back in the RGB channel, adjust Gamma according to how much you want this element to pop. And of course, finish the composite: Defocus slightly with a little fast blur, add a shadow, and you may start to buy it (Figure 8). Figure 8. The result of all your previous efforts includes a subtle shadow that has been color-matched as well as a final adjustment to the white contrast. Life doesn’t always cooperate and provide nice white, black, and midgray references in foreground and background source; the world is much more interesting than that. Figure 9 contains a scene so strongly lit with one color, it’s hard to tell what anything besides the glass would look like under white light, and even that is suspect. Figure 9. Sometimes a source scene will have completely crazy lighting. Once you are confident about how to match it, you may say to an image that is blown out and over-balanced in one direction, “Bring it on.” This one requires as much intuition as logic, but the channel-by-channel approach works. The basic technique still works in this case, but it requires a bit more artistry. Instead of carefully matching specific values, this time you must go channel by channel and simply make each image look plausible in grayscale black and white. This time, begin with the red, not the green, channel, because it is clearly dominant. The foreground needs little adjustment to RGB to work in Red; just a slight reduction in Output White, to 0.85, and it looks pretty good. Move over to the green channel and it’s a whole different story. Were it not for the light of the candle this channel might be black, and matching the foreground clearly means bringing Green Output White way, way down (as low as 0.15). Now it’s hard to tell what’s even happening, so raise the exposure control in the viewer until the scene is somewhat illuminated (up as high as 10.0), and the foreground looks washed out compared with the extreme contrast of the background. Crush black and white contrast by raising Green Input Black up toward 0.3 and lowering Green Input White down to about 0.55. Great, but now the black level needs to be lifted just a touch, to 0.005 (you’d never notice it except that it’s so overexposed). Click the exposure control icon to reset that and it’s looking pretty good. Blue is the same story only more so, and yowza, is there a lot of grain here. Similar Blue Output White and Blue Input Black levels to green will work, but there’s no clear reason to increase white contrast in this channel, so leave Blue Input White where it is, and likewise Blue Output Black. Flashing with the exposure control reveals all. Now for the moment of truth: Toggle back to RGB to reveal a darned good color match happening here. With grain and maybe a little specular kick on the side, this element could look as though it had been there all along. It can be a good idea to take a break when attempting fine color adjustment. Upon return, a clear first impression can save you a lot more noodling. So even in cases where it’s not really possible to be scientific about matching color, there are clear procedures to follow that allow you to make confident, bold, even radical color adjustments in composites.